Thanksgiving. Simply put, it’s the pre-party before Christmas. But its got history and traditions, British history and traditions. Let’s just keep that one quiet, ok? When the Catholic church was ruling the roost in Europe there were over 140 days per year where people were required to attend church, often meaning they couldn’t go to work. The good old Puritans weren’t so happy with this, instead favoring a few days here and there for fasting or giving thanks (thus thanksgiving) in response to particular events (i.e. the harvest). So when the Puritans emigrated to the US during the 1620s and 30s, they continued these days of thanksgiving and in 1621, after a plentiful harvest, the ‘first Thanksgiving’ was held in Plymouth, Massachusetts. This is generally accepted as the root of the modern American Thanksgiving holiday, but there are believed to have been any number of Thanksgivings held in the pilgrims’ early days in New England. The first annual, nationwide celebration of Thanksgiving was declared by George Washington in 1789. Enough history though, let’s get down to the food. There are several foods that are Thanksgiving staples; those dishes you could probably bank on finding were you to conduct a random poll across the Thanksgiving dinner tables of the US. Turkey (obviously), stuffing or dressing (yes, there is a difference which I’ll explain in a later post), cranberry sauce (either in jelly or sauce form, both known as sauce), potatoes in some form (usually mashed), either candied yams or sweet potato pie (the latter being more common in the southern US) and a pie for dessert of course, be it apple, pecan or pumpkin. Over the next week I’ll share my whole Thanksgiving feast with you, starting with the make-ahead dishes. First up is cranberry sauce. In all honesty, you can make a huge batch of this, freeze it in portions and eat it for years. But if you’d rather make it fresh, it couldn’t be simpler. You can tart it up as much or as little as you like by adding all sorts of goodies into it: port, red wine, brandy, star anise, cinnamon, dates. Personally, I always go for orange. Orange and cranberry is a match made in heaven and there’s nothing like the smell of a freshly peeled orange to remind you it’s the holidays. This year I reduced some port first before adding the cranberries, brown sugar and orange zest. It wasn’t quite right though, it still had that cranberry tang that hits the sides of your mouth and makes you pucker up. Not wanting to add any more sugar, I decided to add a splash of balsamic to try and balance the bitterness. It worked! This recipe might be a bit sweet for some people’s tastes, but you can obviously adjust the sugar to taste. Thanksgiving is a time for family, friends and food, so stay tuned for the rest of the feast! What Thanksgiving dishes can you not do without? Leave me a comment below and tell me all about it! 1. Add port to medium saucepan and reduce over medium heat until only about 1 Tbsp remains. 2. Add cranberries, brown sugar, orange zest, orange juice and water. 3. Cook over medium heat with the lid partially on for 10-20 minutes, or until the cranberries have burst and the sauce is a consistency you like. Add more water if it gets too thick. 4. Add balsamic vinegar and a pinch of salt and taste. Adjust where necessary. 5. Sieve or serve chunky. Can be made ahead and stored in airtight container in the freezer for up to 1 year*, or put into a sterilized jar and kept in the cupboard or refrigerator up to 3 months*. *Times may vary depending on storage conditions. Our family cannot do without you! Besides you, Grandma’s stuffing with lots of liver and onion! And let’s not forget the turkey skin! I’m off to get our turkey as we speak! No liver stuffing for me this year, but plenty of turkey skin! Save some skin for the turkey!! Thanks for this. And I’m looking forward to the follow-up posts. 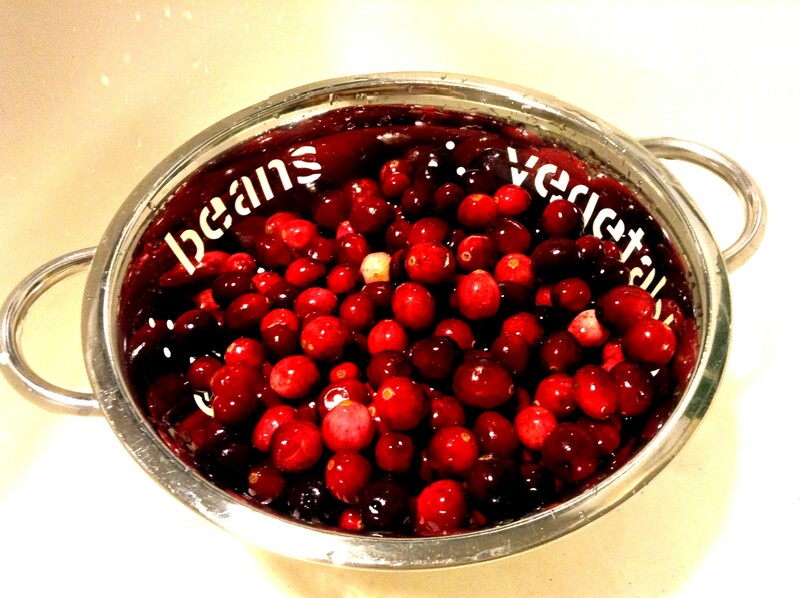 Isn’t it great that cranberry sauce IS so easy? It is probably my favorite part of the Thanksgiving meal, too. I grew up eating cranberry sauce out of a can because that was what my mother was willing to prepare – lol. Boy was I excited when I found out how simple it is to have fresh cranberry sauce/compote. Haha, we had both but there is definitely no comparison. 🙂 Are you making thanksgiving dinner this year? I’m looking forward to discovering your other posts! I will travel to Paris tomorrow to be with my family for Thanksgiving, and my dad always makes the most amazing turkey-stuffing-and-sides, while my mom is in charge of pumpkin and pecan pie. We always have the same meal, and I absolutely adore it. But I also love discovering what other families have for their own Thanksgiving! Thanks, Darya! Happy Thanksgiving to you too! Do you have American/Canadian heritage or do the French celebrate Thanksgiving too?! Yay! Can’t wait to hear what yum mines you eat! Cranberry with lines from the can is my old standby, but the homemade version(s) are so much better.